Fable Vision is a cool company with a mission to champion off-the-path learners by engaging children, educators and families with media, storytelling and technology. They produced another film like this, The Wings of Epoh, in affiliation with SARRC. Makes me want to move to Southwest Arizona! Fable Vision's founder, Peter Reynolds, has authored a shelf-ful of moral, metaphoric tales which are available at your local library including Ish, The North Star, and The Dot. Hollywood is getting a lot of people down. Benjamin Snow spells out yet another way in this entry in the Film Your Issue contest. Check out more photos and details of his trip to New York to be recognized as a finalist here. His mom, Kathie Snow, has endless good resources throughout the same site for your own reading or as teacher resources. I love their logo which is a bowl of 6 apples. Five are red and one is green to illustrate the reality that one American in five is a person with a disability. "A green apple is more like red apples than different. A person with a disability is more like people without disabilities than different. Apples are natural . . . and having a disability is a 'natural part of the human experience." Right on Kathie! I recall our fabulous Team Manager, Danielle Thorp, who lead me through the early years when Reid had a home program and our front door was revolving. In one of our many heart to hearts, she challenged me to think of what autistic tendencies I had. 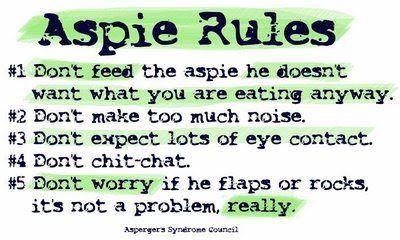 If autism is a spectrum (and it is) then we are all on it--somewhere between "normal" and "severe." Well, after not too much thought and her sharing an obsession she has of counting door hinge sections when bored or anxious, I came up with a lifelong oddizm that does indeed put me somewhere on that invisible line. I count, divide, and otherwise group vowels and consonants into patterns. This may be hard to explain and not worth the effort. When driving on long road trips or sitting through boring sermons, I will take lines of text from a billboard, street sign, or program and get to work. I love it when my little division compulsion comes out even--in other words, the pattern of vowel/vowel/consonant, vvc, vvc, vvc, is the same with no remainders in an entire phrase. So, have me committed, or not. When my mom read A Slant of Sun by Beth Kephart, her first comment was, "you know I am a lot like that." She went on to buy a dozen copies of that book and distribute them to family. To me she expressedd, "now I understand why you don't answer the phone anymore." The beginning of compassion and tolerance is to be able to identify with another. Reid has some idiosyncracies and behaviors which tell us when he is stressed. Most recently, chewing his shirts to absolute shreds alerted us to trouble on the bus. Behavior always communicates; we just sometimes need help in translation. I also notice that his head rocking behavior serves a purpose for him. He used it productively to memorize his baptism song in one sitting. I hadn't seen his head shake back an forth in a distinctive rotation in a long time, so it stood out to me as functional for him. I could practically hear the rumbling of gears shifting as he effectively switched on some section of his brain. What about you...how do you seek order, obsess, or self calm? I am enjoying this father and son duo who are building awareness by making movies together. What I love about their homemade movie is how Junior comes to life expressively by the end of the session. It reminds me that good things come to those who wait....in any given hour, day, or lifetime. Christschool makes a more inflammatory point here in his original post, with which I also agree. While we are vacationing in the Outer Banks this week at a family reunion, I thought you could be enjoying a few short films I've found intriguing and relevant. Seems like a good alternative to packing my laptop and having to endure the whining complaints to "get off that thing!" So, while I'm at the beach....enjoy. I have never been one for bumper stickers or wearing my thoughts on my sleeve. It's one of several ways in which my husband and I are opposites. 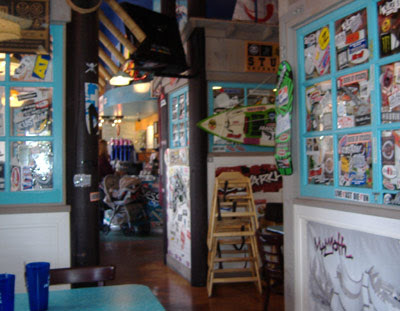 In his college dorm room he had the door plastered, and I mean plastered 3 deep, with stickers from every restaurant, skateboard shop and surf manufacturer he'd ever visited. He loves Wahoo's, for the ambiance. (I do like Wahoo's but for the food, despite the ambiance.) Jim's poor, otherwise tasteful, sleek and trim Mini Cooper has been defaced for a good cause: Save Trestles. An unwillingness to wear my thoughts on my bumper or across my chest does not mean I have no opinions. Oh contraire! I just don't care to offend those who are driving behind me or impose mine on uninterested parties. I am not even inclined to sport the IXOYE fish, although there is nothing I care more passionately about than the gospel of Jesus Christ. Maybe it is my Harmony strength that keeps me unlabeled, maybe just my introversion. Last night though, I benefitted from one bumper sticker. In the unstructured cool of the summer evening, Reid wandered down our street and into some neighbors' yards and garages. We live on a pretty friendly, safe street and several families were out at the time with bikes and dogs so it didn't send panic through my veins as it has in the past. A neighbor graciously informed Allie, who called me and by the time I went out front Reid was casually walking home. He was followed at a distance by a kindly grandfather type to whom I waved (although I didn't recognize him). Clearly he was making sure Reid got to the right house safely. A short time later, the 3 of us pedaled together on bikes into the cul de sac. I noticed an unfamiliar minivan with the infamous autism puzzle ribbon on it. Come to find out the kindly grandfather is David. His grandson also has autism and yes, that is his van. How we've both lived here for 7+ years and never met, I'll never understand. In any case, I thanked him for "walking Reid home" and we had a nice chat about his various grandchildren, mainstreaming, and the new puppy he was walking. So the blasted bumper sticker does serve a purpose, I must confess, as conversation starter, introduction to new (and not so new) neighbors, and unifying element. If I ever sport any autism gear, (and that's a big if), it will not be the puzzle piece or the puzzling print but maybe one of these, available through Oddizm Autistry at CafePress. 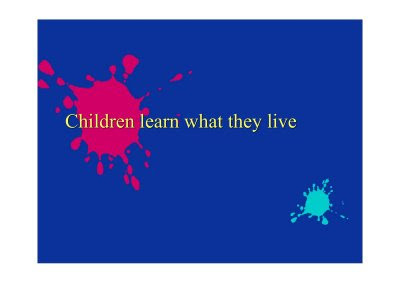 I have a fuzzy but distinct recollection of a print in my house growing up of Children Learn What the Live not unlike the one pictured here. I associate it with my mom who was a teacher and with the values she upheld in our household. 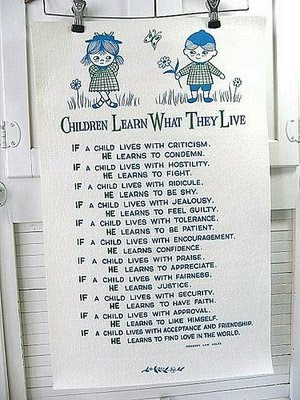 I don't know what ever became of that poster but apparently the original poem was written in 1954 by Dorothy Law Nolte and was later made into an entire book about parenting and imparting values. At first glance it may seem hokey, but whatever your aesthetic, there is undeniable truth in the verse. Children of all ages do learn more from what we do as parents than from what we ever say. It is not coincidence that many of the parents blogging about autism from a positive, accepting perspective have children who in turn, are learning and articulating gratitude and acceptance of their siblings. Here are two examples. S.L. at Stop Think Autism uses a subtitle I love: "Having autism is not the end of the world...far from it." Her older child made a lucky clover at school and filled in the blank that she was "lucky to have.... a sister with autism." Her post embellishes how it really is possible to have healthy siblings in the same household with our kids on the spectrum. What's impossible is to "sell it too well" as her husband jokes about promoting autism as part of their unique family culture. We bought that very same book she references, My Friend Has Autism, and gave them out as favors at Reid's 7th birthday party for our friends to read. My feeling was always that the more family friends who embraced our entire family, the better off we'd all be. That meant less embarrassment for my daughter, more informed playmates for my son, and more adults to support my daughter in awkward situations. These were sure to arise since we were spending lots of time homeschooling and going on fieldtrips with these families. I really needed them to back me up and bolster my intentional attitude at that point. were some slightly older, typically developing peers who would come over for facilitated playdates with Reid every week. Using Pamela Wolfberg's Integrated Playgroups model, they were modeling social skills, turn taking, eye contact, and the pure pleasure of play. Looking back with 7 years of hindsight, there is no question those "expert players" who were willing or whose moms made them participate, learned more than Reid did. One of them recently graduated from high school--now a big, strapping football player. In a senior essay he reflected about what he'd learned from helping Reid over the course of 2 years. He was the oldest in a family of four and set the pace for his next oldest sister and brother to move into roles of regular weekly playdates with Reid. The youngest in that family never got his turn, as Reid moved into an all day school setting. But, little Carson used to ask, "when do I get to play with Reid?" Caring, encouragement, praise, acceptance and tolerance (see the poem) were what those kids were living! Those were esteemed values in the Ward family...and left a legacy of confidence, appreciation, love, and patience in our hearts as well as theirs. 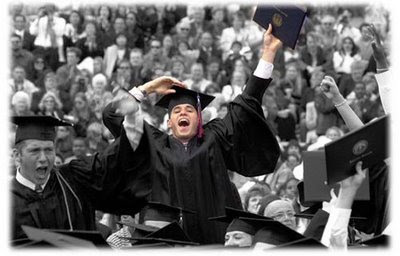 Joining the ranks of college graduates this past June was Erik Weber. With the vision, determination, and support of his mother, Sandy, Erik made a way for himself at Grossmont College in San Diego. In his own pace and with some accommodations, he did it! Worth celebrating ! And repeating! Read all about it here. His success story strikes a familiar chord in three aspects I notice consistently: 1. his mother's never-say-never, find-a-way attitude; 2. Erik's acceptance of gradual and steady progress; and 3. their capitalizing on his special interests. If the incidence of autism is indeed rising, all college teachers might need to learn to make adjustments for these students, who undoubtedly will seek higher education. How true! Who do you think learned more that semester, Fred or Mr. Yoder? I have often said that Reid is a great teacher, meaning that he is such a demanding, complicated, (yet undeniably smart) kid that anyone in the position of teaching him learns more from him than they could in any degree program, continuing ed seminar, or years of experience. All rolled into one irresistible ball of fire, he can teach anyone willing to learn the importance of being honest, following through, doing what you say, maintaining instructional control, attention to detail, organizing classroom materials, planning ahead, being flexible, differential reinforcement, you name it. One of our early, home-program therapists recognized how much Reid had taught her. Wanting to accelerate the learning curve of her new recruits, she donated session time to us so that Reid could develop and break-in her employees. "Iron sharpens iron"(as the Bible says in Proverbs 27:17) and she counted on Reid's mettle to sharpen the skills of her staff. We took her up on the offer! Here is yet another example of how much power music has to give hope, to provide opportunity, to build awareness, to demonstrate skill, to make you cry, to entertain, to enable communication, to enhance our understanding of others, to change the world. David Militello sang Ben by the Jackson Five on America's Got Talent and won the hearts of the audience. I love the part when his mom shares what she is thinking; this is what he was made to do. Some call that destiny. 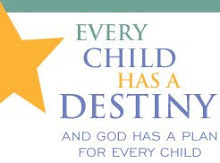 The belief that we each have one inspired the formation of Children of Destiny and is laced through the books and resources they provide from daily prayer subscriptions to AutismOne Radio broadcasts on Sunday. What is it you were made to do? The lyrics of that song are pretty poignant in themselves. I am enjoying a devotional from the library by Ann Spangler, Praying the Names of Jesus. In it she devotes one week to meditating on Jesus as Friend. He is the one who lays down His life for a friend (John 15:13), who cares about the daily goings-on of his disciples and asks, "Friends, haven't you caught any fish?" (John 21:4-7), and who no longer calls us servants because "everything that I learned from my Father I have made known to you." (John 15:14-16) You've got a friend in deed! 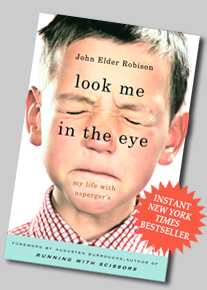 Arguably the two most articulate and successful adults with autism are Temple Grandin and John Robison. Their insight, personal experience, and advice is invaluable to those living with and on the spectrum. Their books are honest overviews of the challenges of growing up with autism as well as the ability, hope, and potential that can materialize from every hurdle. Watching these two clips, one is struck by the advice they give in unison: to identify and pursue special interests as a key to adult independence and success. The truth of which they speak is underscored by their very different upbringings of a generation ago. In Robison's case, being obsessed with electronics and pyrotechnics provided an escape route from a dangerously dysfunctional home. In Grandin's case, it cost her mother her marriage and almost her life to follow a gut feeling that Temple had cognitiv e ability. 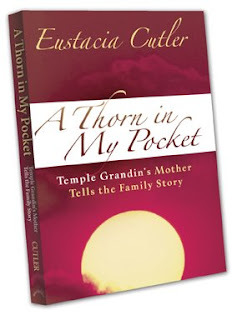 Temple's mother, Eustacia Cutler, tells her own story on tour and in the book, A Thorn in My Pocket. It is inspirational to hear this genteel woman describe how she stood in the face of major opposition to save her daughter from an institution. Unknowingly she was also paving the way for future generations of different learners and those who advocate for them. Whether it is Star Wars, math, mechanics, electronics, animation, music, or trains, niche interests (some would say splinter skills) can lead to significance, life purpose, and world changing contributions. Developing and nurturing those strengths should color the way we write IEP's, choose summer camps, and spend free time.